If there’s one thing I feel like we all struggle with, it’s choosing paint colors. Even after 15 years of designing and fixing up homes, I still struggle to find that “perfect” color sometimes. Different surfaces call for different types of paint too – you wouldn’t paint your exterior door with the same paint you used on your bathroom walls. So I’ve done some more research and tracked down some tips from our favorite paint guru, Joanna. 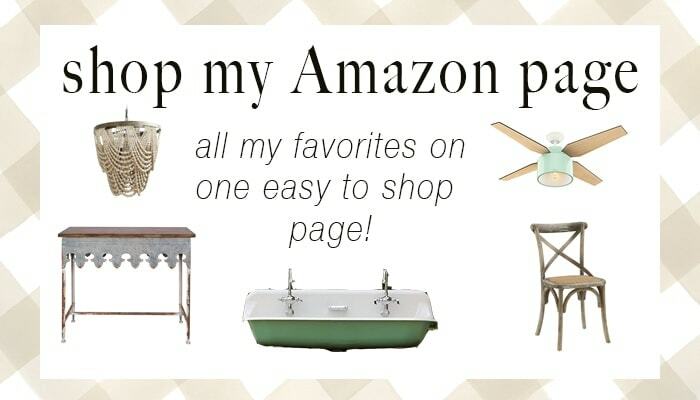 So follow along and find out the best paint for cabinets and some favorite colors to use too! 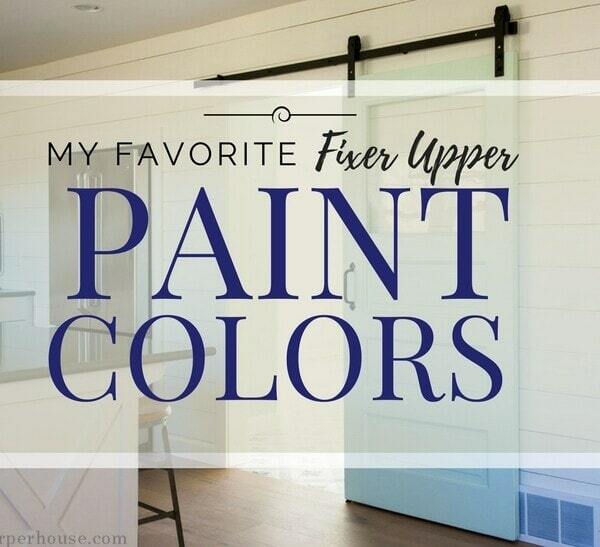 And also check out this post for even more favorite Fixer Upper paint colors. I use oil based paint on all my cabinets and trim so it is easy to clean. I always like to get samples and put them up on the wall before I determine what color to go with. I carefully study the tones that are in each color based on the amount of natural light and lighting I have in the room. 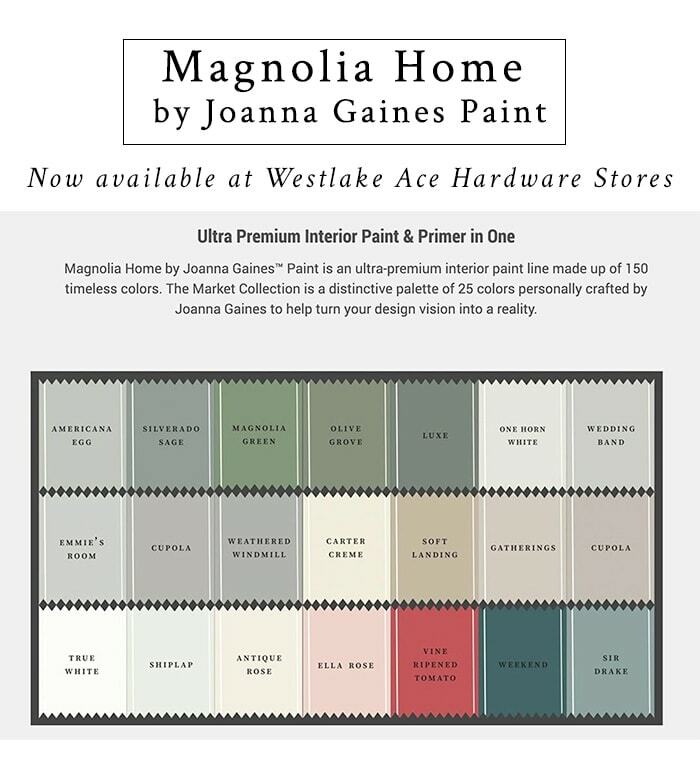 Joanna’s new paint line will now be available at select Westlake Ace Hardware stores! They have 98 neighborhood hardware stores in Iowa, Kansas, Missouri, Nebraska, North Carolina, Oklahoma, Texas, and New Mexico. It has been part of the Ace hardware distribution network since 1959, and a wholly owned Ace subsidiary since 2012. Sadly, I don’t have any in Illinois – but check their website to find a location near you. I’ve always thought it strange that Jo only sold her paint line at her store in TX – I mean, who wants to pay for shipping gallons of paint?!? But hopefully, they’ll start rolling it out to other distributors soon too! If you don’t have access to Joanna’s paint or prefer not to use oil based paint, both Sherwin Williams and Benjamin Moore offer a water-based acrylic alkyd paint that is recommended for use on cabinetry. Here’s a really great post from Katie at Bower Power blog comparing the two types of paint. Now enough about paint, what is the best paint colors for cabinets? All of the above kitchen cabinets were painted Alabaster by Sherwin Williams. 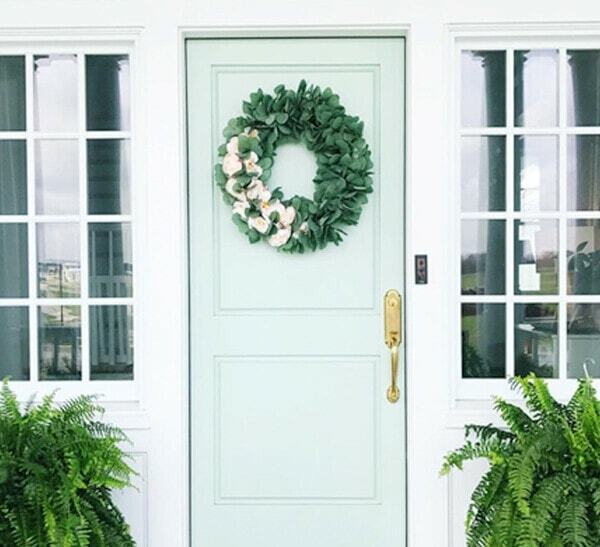 I’ll be posting more info soon about the best paint colors for exteriors and front doors, so stay tuned! Also be sure to check out my other post which features Joanna’s Favorite Paint Colors for interior spaces. Do you have some tried and true favorite paint colors? Be sure to share them in the comments. I'm a former copywriter addicted to shiplap, Pinterest, and chocolate chip cookies. 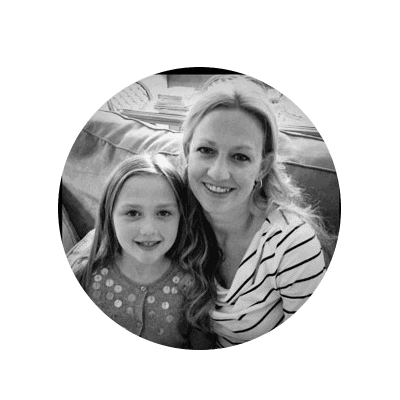 I now happily help my hubby flip houses full time, while documenting our adventures on the blog. Thanks for reading! 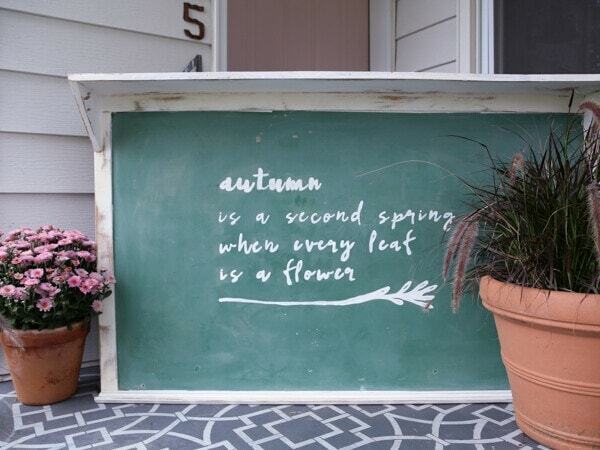 DIY Chalkboard Lettering – The Easy Way! 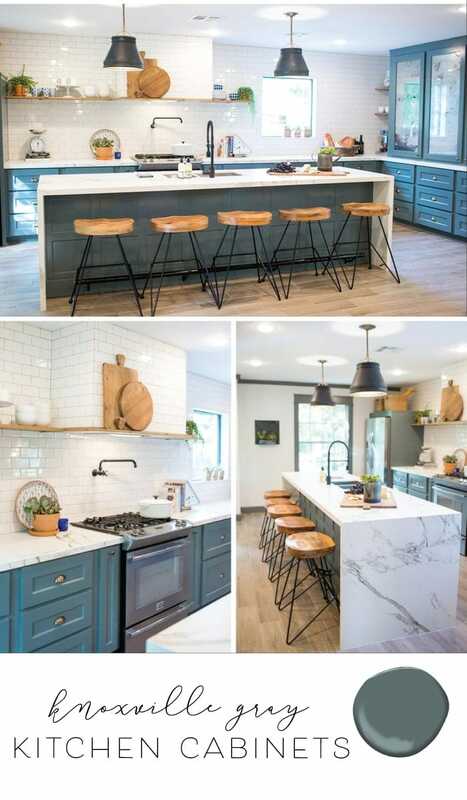 I love the color of the cabinets with the white subway tile. It’s like a gray and green darker. What color is this? what finish does she put for example, oil, latex, egg shell etc??? 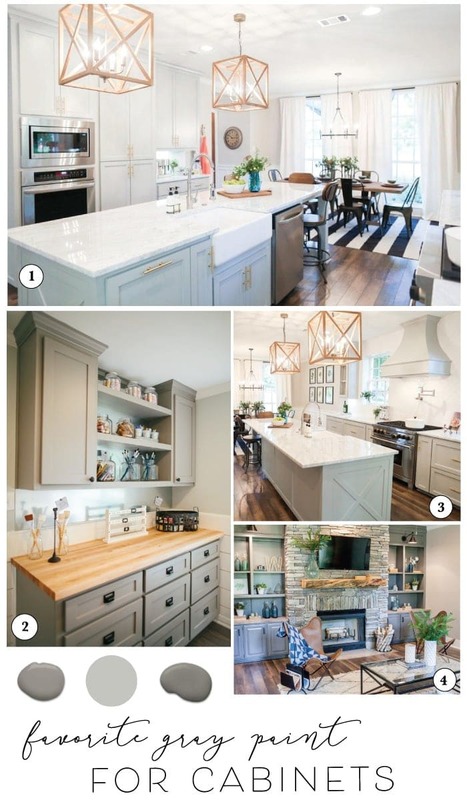 She uses oil based paint for her cabinets and trim 🙂 But if you don’t want to mess with oil both Sherwin Williams and Benjamin Moore have some good water based enamel formulas that I mentioned in the post. Thanks of stopping by! Christy we are painting our cabinets this summer and this will come in super handy! Thanks for the info!! It’s nice to know they’re spraying oil based paint when I see them paint the cabinets on the show. That will hold up better in a kitchen than latex. On my bathroom vanity I used latex acrylic and it’s holding up pretty well. Yes, oil is king when it comes to durability! I just need to get past the stinky factor, lol 🙂 Thanks for stopping by Toni! In Season 4 Episode 12, what colors did she use for the living room, kitchen, and entry? 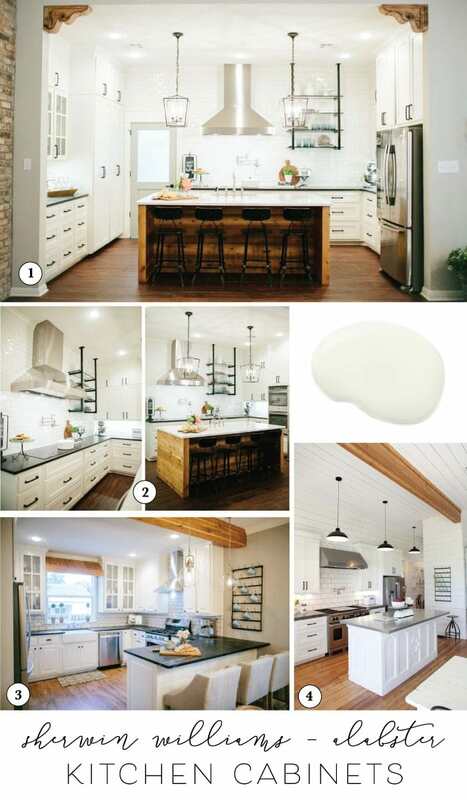 Do you recommend the alabaster by Sherwin Williams for a kitchen with cream colored tile floor? I have more brown/tan undertones in my kitchen and will not be replacing the floors any time soon! My best advice is to get a small sample can of the whichever paint you are considering (in this case Alabaster) and paint a sample on poster board or the actual wall to see how it looks in your space with your lighting conditions and undertones in the room. It’s hard to recommend colors because the lighting conditions in each space drastically changes the look of the paint. Thanks for reading! Wont oil yellow more over time when doing white? I’ve never had any issues with white paint yellowing over time. I think the paint formulas used today are much better than in the past, so I would not be concerned with yellowing. Hi Christy! Love this post! What do you think is a good white to pair with SW Alabaster? Hi I have white appliances and I am struggling to figure out which white to paint my cabinets. The options above are all beautiful and I’m leaning towards a warmer white but I’m not sure how it will look with my appliances. Suggestions? I’ll be doing a traditional white subway tile backsplash and I think intellectual grey (something warm as grey/brown) on the walls. THANK YOU! Hi! Thank you for this post. I was wondering, you mention oil based is what she recommends but what about the finish? Should it be satin, eggshell, matte, etc? I love the stone fireplace with the gray bookcases. It says the color used is SW Gauntlet Grey. I have stained red oak bookcases that i want to change. Can you paint over the stained cabinets without sanding/stripping down to natural wood? I’m not an expert, but I have painted over stained wood before and have never stripped it down. You would want to sand them slightly and use good primer though. I really like Zinsser’s Bin Shellac based primer as it seals knots and will prevent any bleeding from the stain. It’s available on amazon – http://amzn.to/2E97QDz. Hope this helps – good luck! Do you have ideas on what paint color were used in the newest episode with Tim Tebow? I’m specifically curious about the exterior colors. Wondering if the front door is painted Knoxville gray or one of Joanna’s new paint colors. 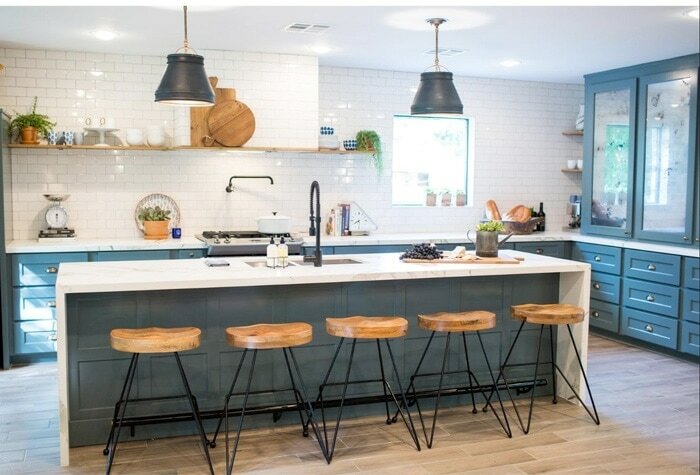 Do you happen to know the paint color that was used on the kitchen island in the picture labels 1 and 3 that have the square wooden pendent hanging over it. I love it and i bought those same pendants for my new house. Do you have any suggestions for shades of brown for painting kitchen cabinets? Hmmm, not quite sure what shade of brown you’re wanting? light brown, dark brown, taupe, tan? SW Urbane Bronze is a favorite blackish brown and SW Sable is a good chocolate brown. Your best bet is to just grab a few samples to see how they look in your space. Good luck! If I paint my cabinets, should the insides be painted as well to match? Husband and I can’t seem to agree. Hi Liana, painting the inside of your cabinets is really personal preference. I think it is perfectly fine if they’re not painted. However, if you have the time and motivation I would probably go ahead and paint the insides. 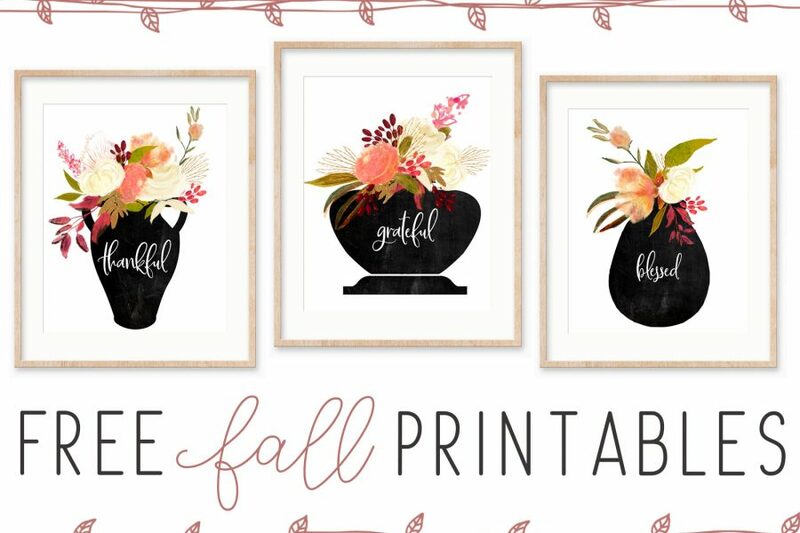 It’s a little more work, but will add the finishing touch to your kitchen! Good luck! Any idea what the cabinet color was in “A big country home”? I’m using white quartz countertops and wanted to use Alabaster on my trim/cabinets but I’m afraid it will be too creamy against the white quartz. I’d like for it to look soft without being too stark white. Sorry I don’t have any info on the cabinet color for that house. However, your best bet would be to get a few samples of the color you’re interested in (in this case Alabaster) and paint the sample on a large piece of posterboard and take it to your quartz manufacturer’s showroom to see what it looks like next to your sample of quartz. There’s really no magic way of doing it unfortunately, you just have to see the colors next to each other and it’s also a good idea to take a sample of quartz home to see what it looks like in your own space with the natural light, etc… Good luck! I would like to repaint my kitchen cabinets to classy elegant ivory color. What would be the name for the paint color? Not too yellow. I’ve used Linen White by Benjamin Moore in a previous home and it is a nice warm white/ivory. Hope this helps! HI Christy! We are painting our kitchen cabinets chantilly lace but I’m thinking of painting the island a gray since it’s a fairly high traffic area. Do you have any suggestions on a gray? I really want to steer clear the blue/green tones. Would dovetail do the trick? Thank you! I think dovetail would be beautiful. I also love Fieldstone by Benjamin Moore and Intellectual Gray by Sherwin Williams. Good luck!